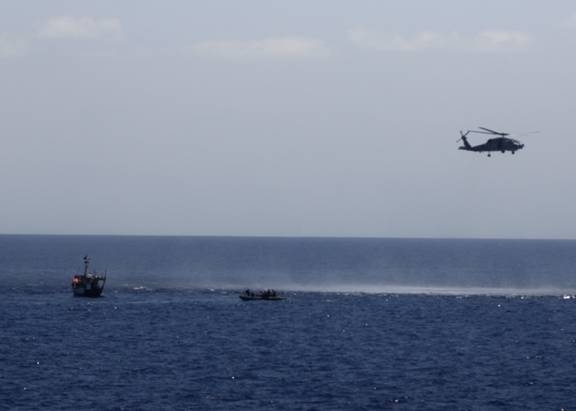 ﻿Guided missile destroyer USS Mason (DDG 87), flagship of the Singapore-led Combined Task Force (CTF) 151, freed a dhow from suspected pirates in the Arabian Sea, April 10. ﻿ The FV Nasri was initially sighted on April 9, by an Australian Maritime Patrol Aircraft. USS Mason, being the nearest warship, was tasked immediately to close and investigate. Mason and its embarked helicopter located the Nasri early on the morning, April 10. The helicopter’s crew saw 16 personnel, a motored skiff, a ladder and several oil barrels on board. The personnel on the dhow complied with verbal warnings to stop, and assemble on the deck where they could be clearly seen. The boarding team from Mason searched the dhow and found weapons and other common piracy paraphernalia, such as ladders and excessive fuel drums. They identified 11 of the men as suspected pirates, and five as members of the dhow’s crew. Pirates are known to use the crew of captured vessels as hostages and also to operate their vessels as mother-ships from which to launch further attacks. The Nasri was returned to its crew and departed the area. CTF 151 is a multi-national task force established by the Combined Maritime Forces (CMF) in January 2009 to conduct counter-piracy operations in the Gulf of Aden, Somali Basin and Arabian Sea. The Singapore Navy Forces assumed command of CTF 151 on March 31.